This week marked a slight change of direction for my designing life! For many years, I had a ready outlet for my designs when eight magazines were regularly publishing my projects. By the end of last year, that had all gone pear-shaped, when seven magazines had disappeared, and the only one remaining reduced their issues to bi-monthly. To add to the devastation, you will remember that Craftsy (now Bluprint) removed thousands of designer projects from their website. Instead of having my 200 patterns available, there are now just five paying patterns in my Craftsy Store. Three months have passed since all those 'blows' and I have survived, even thrived! All my designs are now available from my website and I really appreciate the great support that people have shown in still purchasing my patterns. Then, on the recommendation of some of my readers, I started a small Etsy shop. The sales there have started to trickle in too, so I have much for which to be thankful. The other outlet that has closed for the moment is the opportunity I had to sell ready-made bits and pieces at craft stalls as I am not able to attend Craft Retreats and Shows for now. With so few outlets for my original designs, I am not designing two or three projects a month as I used to, but I still LOVE stitching! This has given me the opportunity to make a quilt using someone else's design, which I never had time for before. It's also encouraged me to attend to some of my PASSES (Projects at a Stand Still) and make a start on seeing them through to completion. And it has led me to the decision to try selling some of my ready-made hand-crafted items on Etsy. Like this little boy's Toy Quilt. 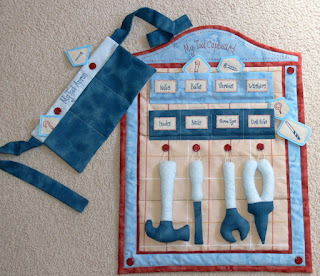 All the pieces are removable and it even comes with a Tool Apron. When play is over, it becomes an attractive wall-hanging again. I've also put some of my hand-embroidered zippered pouches on Etsy. When I looked to see if people were selling things like that there, I discovered there were 250 pages of pouches (with 64 on each page)!!! I don't like my chances of anyone actually finding mine amongst all those! But, who knows what might happen! So I am trying this slight change of direction and wait to see where it takes me! So, all the hand-crafted projects you see in this post are available in my Etsy Store. Delivery is even free if you live in Australia! I'm feeling that there is a happy balance now, with enough time for the volunteer work I do with the church, adequate stitching time, outlets for selling my patterns and the possibility of having a market for my ready-mades. God is good - He has rescued me as He promised! I hear you! With all of the Aussie magazines closing down last year and the Craftsy shake up, I was in the same sort of boat. In this time, I've enjoyed slowing a lot more slowly and actually enjoying the process rather than rush, rush, rush. Val, I am glad things are working out for you. I know last year's announcement by Craftsy was really hard for designers like yourself. You do such beautiful work. Sending good thoughts and wishes that your new direction will flourish. Stay positive. Sometimes Val, God slows us down a bit to cause us to re-evaluate where we are going and why, and He always provides direction if we seek it! So glad you have found your happy balance! God is good - all the time!! What a wonderful attitude you have...I often say I don't know how non-Christians handle life's hard times. Faith seems more essential (like air) the older I get and the more our world is changing. I wish you well with your Etsy shop and hope this will prove to be a wonderful outlet for you. I was very disappointed in Craftsy...I had loved them from the beginning and will be letting my membership expire when it runs out (I tried to cancel, but they wouldn't give me a refund). The way you treat people ought to mean something and they treated the designers very poorly--no respect at all. So, all good wishes for you and thank you for being a shining light in the craft world! Big changes, indeed. I’m not at all happy with Craftsy, now Bluprint, and have so little respect for them, The only business they’ll get from me is when I visit my pattern pages and already purchased classes now. Your work is beautiful, and I’m sure your patterns and finished projects will sell on Etsy. Good luck with that! Good Luck with your Etsy venture....I think we are all still gob-smacked about the Craftsy/Bluprint debacle....one certainly wouldn't look at a name like Bluprint for craft stuff!! !